Including members of some very well known 80's bands The Deep Six aim to revive soul and R 'n' B in 2017. Fronted by Mark McGounden of Mod Revival band 'Makin Time' ( favourites of mine) and of 'Upper Fifth' fame. His voice will transport you back to that soulful revival band that gained a solid following nationwide. On rhythm is Paul Hooper-Keeley one of Lincolnshires finest mods with talent who released a string of classic albums and singles in the 80's. Tony Barbados is keeping the beat on the drums and new recruit Niall Keohane takes the roll of bass player. The Deep Six are hear to play their own tunes in a forward thinking manner whilst taking sprinkles of inspiration from the past. One thing that strikes me immediately about this album is the production value. The lads are sounding great and the songs fresh and vibrant. That's what I've come to expect from albums released on 'Heavy Soul' records, they are all made with care and attention to detail something that is explicitly linked with the mod movement. Album opener, 'Brand New Day' throws you straight into The Deep Six's sound which I believe is modern folk music with sixties heritage. Not bad at all! The bands harmonies are spot on in this tune and they give you an idea of what you should expect from the rest of the LP. Feel good tunes made with passion and skill. 'Sorry' is another personal highlight for me. It ups the tempo for the album and shows the lads at full pelt, I bet it's great in a live set. With an album that sounds predominately acoustic it really works having a track with a more electric live feel in there. It makes the listener sit up and pay attention and really adds to the overall sound. The album appeals to many different tastes and really crosses a lot of genres which can only be a good thing. You can really hear the lad's influences in this LP and they span a few generations The Jam, Style council, LOVE and Eric Clapton can be heard by me among many others. 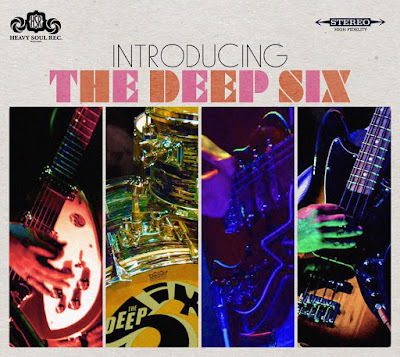 The Deep Six are incredibly talented musicians and you can tell they have passion for their tunes as it's evident in the entire album across all 14 tracks. 'Obviously' is another personal favourite of mine, it grooves along and the lyrics really hit home. "It's just like derby day the winner takes it all and they throw it all away" any football reference is a huge yes in my book and this tune is another standout on the LP. Overall The Deep Six have produced an excellently crafted debut album which delves into many genres and eras for inspiration. It's definitely worth a listen and will leave you wanting to catch the lads live.